Winning an NCAA Championship is every college kid’s dream, just like winning an NBA Finals is the ultimate goal for an NBA player. Despite the ever-so-slim chances of winning both, a handful of players were able to pull off the incredibly rare feat. 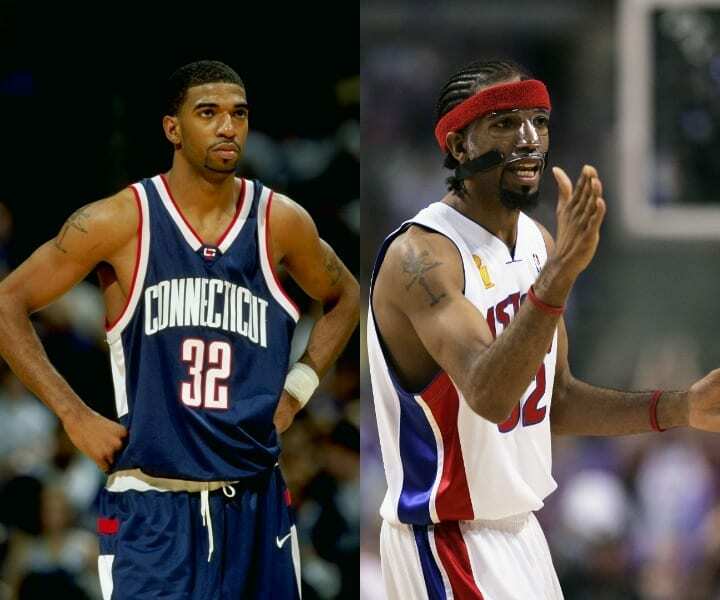 Here are 30 hoopers who were crowned kings of the court in college and in the NBA. The College of the Holy Cross, located in Worcester, Massachusetts, is not known for its athletic department. However, back in the 1940s and 50s, the Crusaders were actually a successful program both on the gridiron and basketball court. One of their star basketball players was Bob Cousy, a point guard with great handles and a silky-smooth shot. During his sophomore season, Cousy and the Crusaders won the 1947 NCAA Tournament, beating Oklahoma in the title game. In 1950, the Celtics selected Cousy third overall. 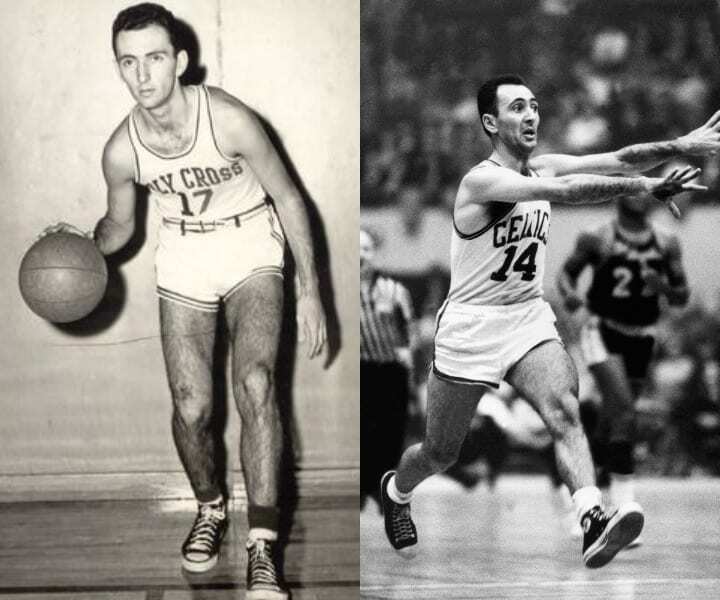 In Boston, Cousy would win six titles while establishing himself as one of the league’s premier guards. Back in 1955 and 1956, the biggest attraction in San Francisco wasn’t the Golden Gate Bridge. It wasn’t the professional sports teams, either. It was the University of San Francisco Dons men’s basketball team, led by Bill Russell. Russell led the Dons to back-to-back national championships which included an impressive 55-game win streak. 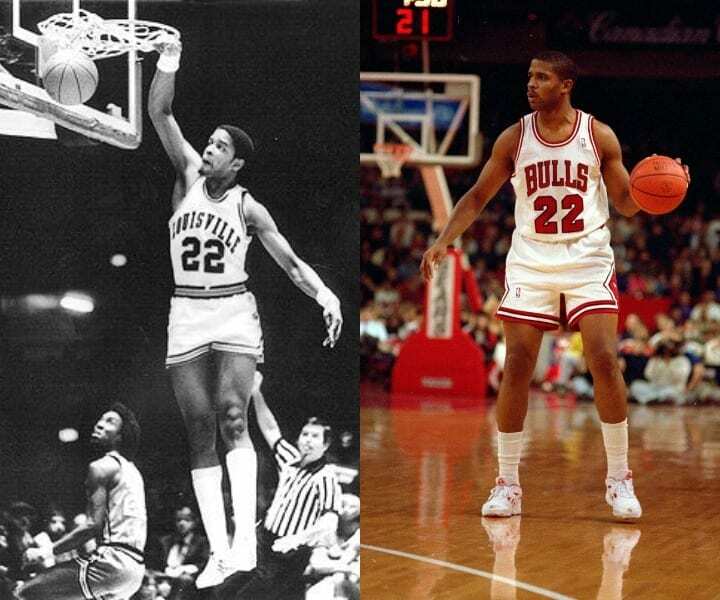 In college, Bill, the nation’s most outstanding defender, averaged 20 points and 20 rebounds per game. In 1956, the Boston Celtics made him the second overall pick. From the outset, Russell dominated and became the most decorated player in NBA history, winning 11 championships and five MVP awards. 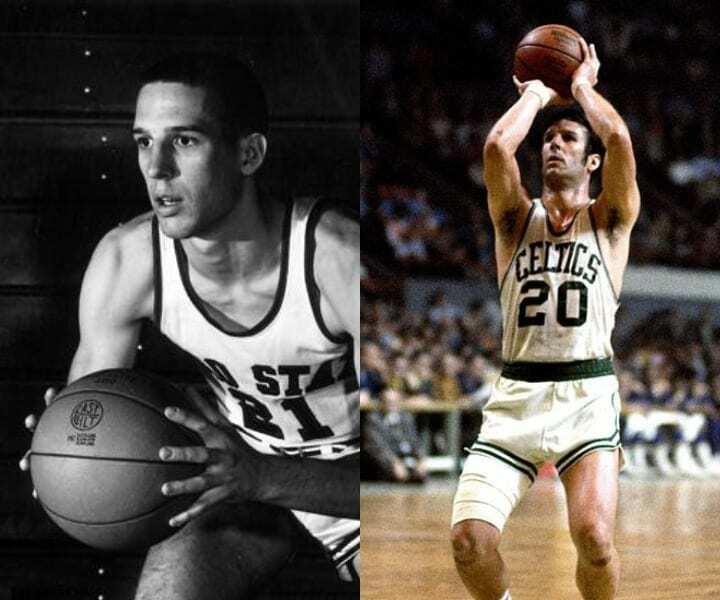 Everyone remembers John Havlicek for stealing the ball in the 1965 Eastern Conference Finals. That crucial steal helped Boston secure the victory and a spot in the 1965 NBA Finals. The call, “Havlicek stole the ball!” reverberated around America. Before Havlicek stole the ball and helped his Celtics win eight NBA titles, he was stealing hearts at the Ohio State University. A standout Buckeye, Havlicek scored 12 points and secured six rebounds in the Ohio State victory over California in the 1960 NCAA Tournament championship game. After three years at OSU, Havlicek declared for the draft. Boston chose him seventh overall and the OSU product played his entire career there. Ferdinand Lewis Alcindor Jr. took the nation by storm during his three years at the University of California Los Angeles. Under head coach John Wooden, Lew Alcindor and the Bruins won three national championships while the 7-foot-2 center racked up virtually every significant individual accolade, such as Most Outstanding Player in the NCAA Tournament and NCAA Player of the Year. In three years, Alcindor and the Bruins compiled a comically good 88-2 record. Taken first overall in 1969, Alcindor, who publicly went by his new name Kareem Abdul-Jabbar starting in 1971, won six NBA Finals and six MVP awards. 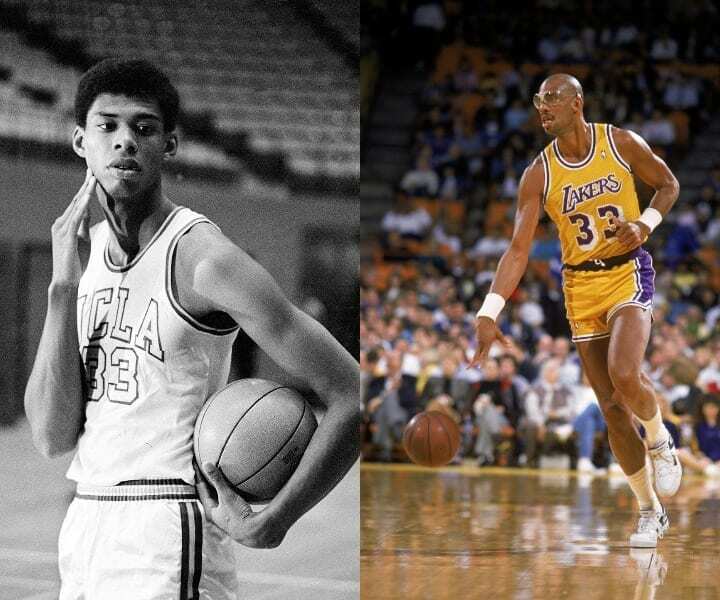 Abdul-Jabbar pioneered the skyhook and ranks first in NBA history with 38,387 points. Another UCLA standout, Bill Walton played for the Bruins from 1971-1974. There he won two national championships and was named the NCAA Player of the Year three times. The Walton-led Bruins went 60-0 in his first two years with the school. 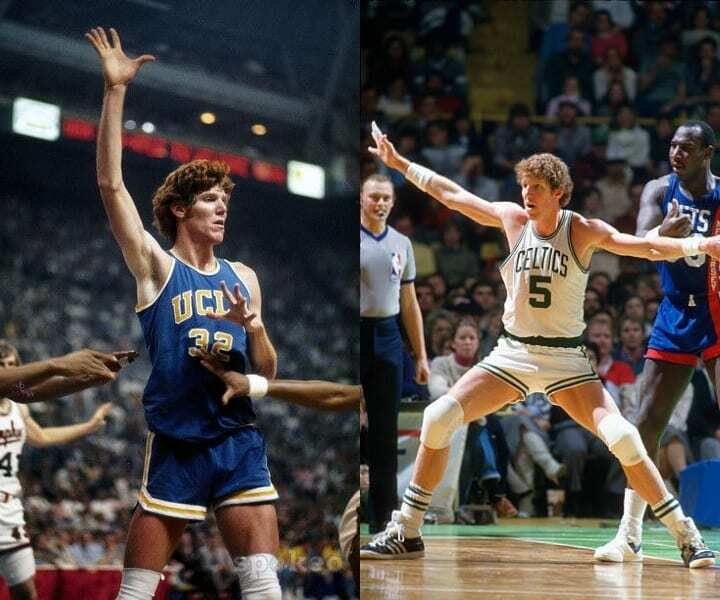 After the 1973-74 season, where UCLA’s improbable 88-game win streak was snapped, Walton declared for the NBA Draft. Portland selected him No. 1 overall in 1974. Despite having an injury-plagued career, Walton managed to win two NBA titles and was a two-time All-Star. 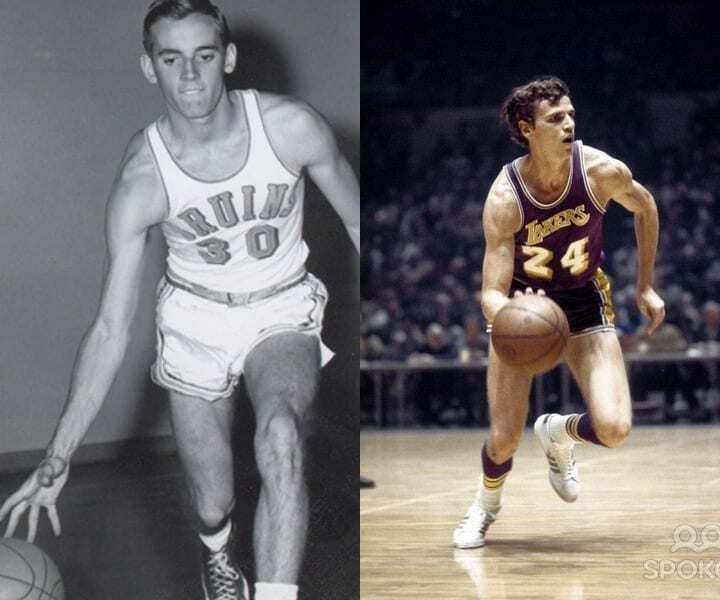 Walton’s son, Luke, is also a two-time NBA champion, making them the first father-son duo to win multiple NBA titles. 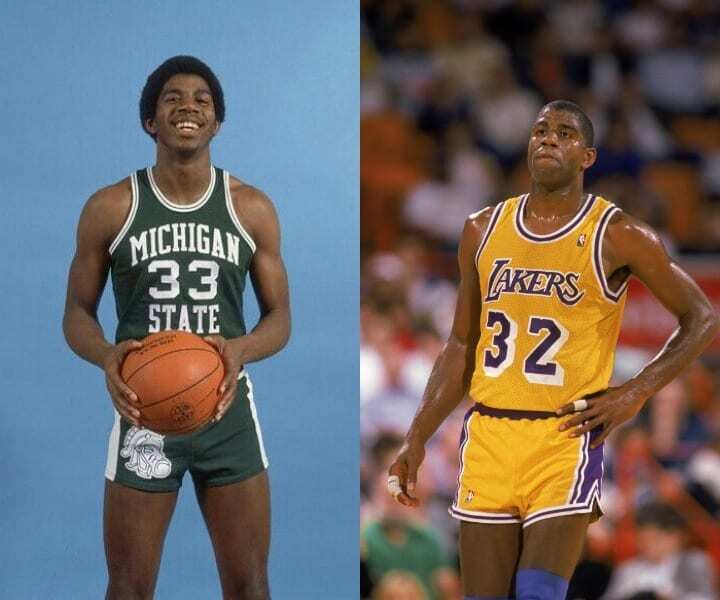 In 1979, Earvin “Magic” Johnson and Larry Bird battled each other in the NCAA Tournament championship game. In a game that was a precursor to epic Johnson/Bird clashes in the NBA, Johnson’s Michigan State Spartans edged out Bird’s Indiana State Sycamores in the most-watched college basketball game ever. Johnson, who was voted Most Outstanding Player of the tournament, declared for the NBA Draft and was scooped up by the Lakers with the No.1 pick. Wearing the purple and gold, Johnson went on to win five NBA titles and three MVP awards while cementing himself as the best point guard of all time. 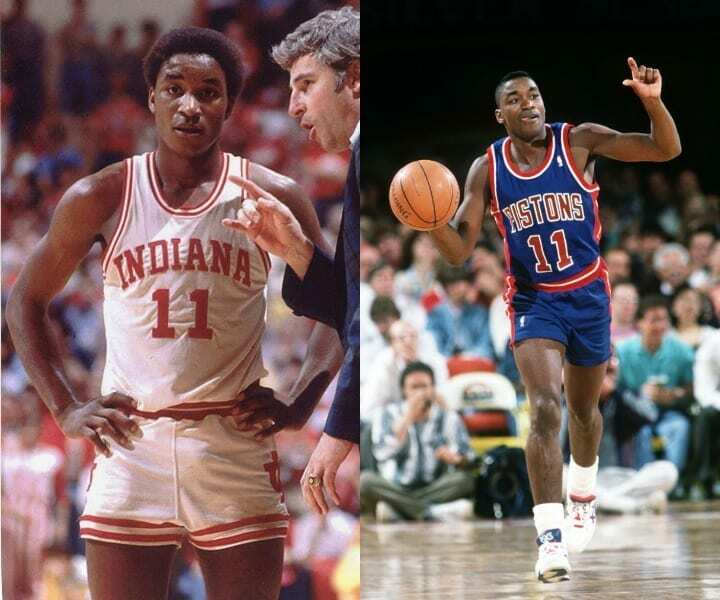 One of the scrappiest point guards of ever, Isiah Thomas got his start at Indiana University under head coach Bobby Knight, a notorious disciplinarian. Thomas’ freshman year got off to a rocky start as he and Knight quarreled with each other on a regular basis. However, as Thomas’ skill-set evolved, the two grew close. As a sophomore, Thomas, a team captain, led the Hoosiers to the school’s fourth national championship after beating North Carolina in the title game. Thomas was then taken second overall in the 1981 NBA Draft by Detroit, the team he played for his entire career. As a Piston, Thomas won two NBA Finals and was a 12-time All-Star. Everyone who’s heard of basketball has heard of Michael Jordan, a six-time NBA champion and the greatest basketball player of all time. Some would consider him the greatest athlete ever. The Bulls, aided by Jordan’s clutch shots and heroic performances, had two separate three-peats starting in the early 90s. But it wasn’t in Chicago where Jordan found his clutch gene. As a freshman at the University of North Carolina, Jordan hit the game-winning shot in the 1982 National Championship game against the Georgetown Hoyas. That pivotal shot set the stage for what would be a legendary career for the kid from Carolina. A teammate of Michael Jordan at the University of North Carolina, James Worthy capped off his junior year with a championship after vanquishing the Georgetown Hoyas. In the final seconds of the game, Worthy, who had 28 points, intercepted an errant pass from the Georgetown point guard, sealing the victory. For his efforts, Worthy was named the tournament’s Most Outstanding Player. In the 1982 NBA Draft, the Lakers selected Worthy first overall. He played his entire career in Los Angeles, winning three NBA Finals while making seven All-Star teams. Worthy, hobbled by chronic knee pain, retired prior to the start of the 1994-95 season. In 1989, the Michigan Wolverines were crowned kings of the college basketball universe. They capped off an impressive season with a dramatic 80-79 victory over Seton Hall in the national championship game. 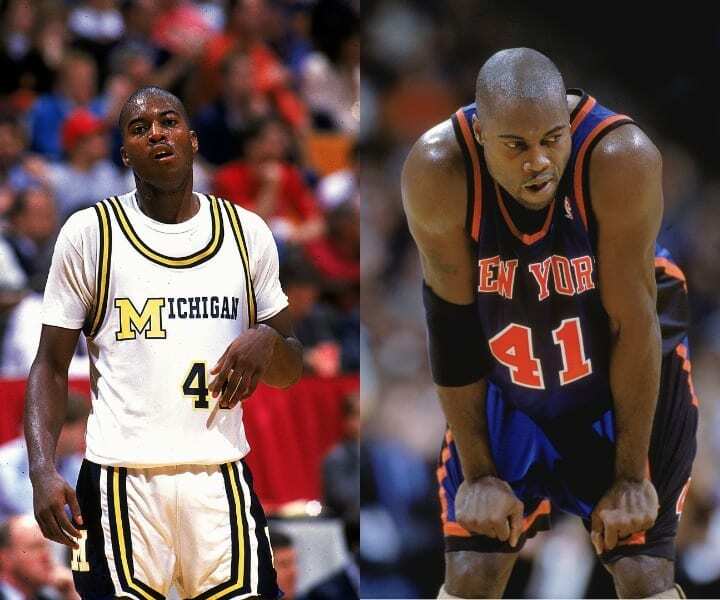 Leading the charge for Michigan small forward Glen Rice, the tournament’s Most Oustanding Player. In the championship game, Rice led the Wolverines with 34 points and 11 boards, and in the 1989 NBA Draft, the Miami Heat, a young franchise, selected Rice with the fourth pick. In 2000, as a member of the Los Angeles Lakers, Rice won his first and only championship. He was also a three-time All-Star. The Arkansas Razorbacks. When most people think of this school, they think football. But back in the early 1990s, Arkansas was a formidable team on the hardcourt. The Razorbacks went to back-to-back national title games, beating Duke in the 1994 game and losing to UCLA in the ’95 game. 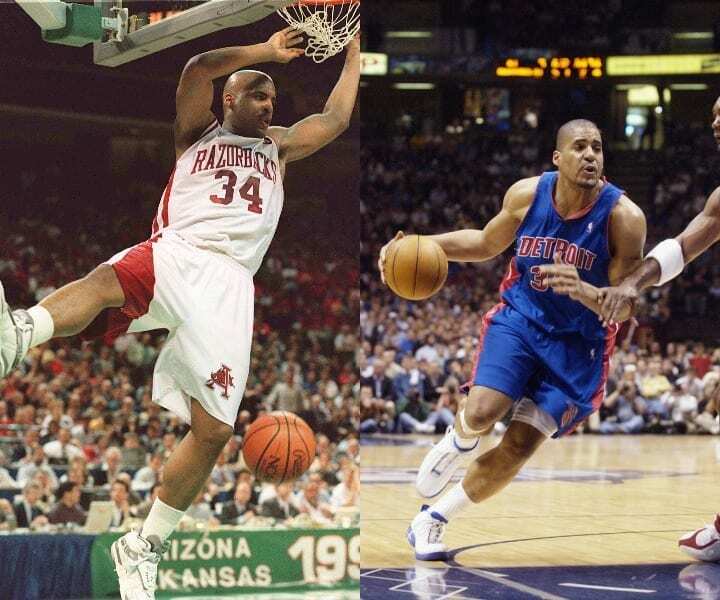 One of the team’s leaders and go-to scorers was Corliss Williamson, a two-time SEC Player of the Year and the 1994 tournament’s Most Outstanding Player. In the ’95 Draft, the Kings selected Williamson No. 13 overall, and in 2004, as a member of the Pistons, Williamson won his only ring. He was also the NBA’s Sixth Man of the Year in 2002. Antoine Walker spent the majority of his career with the Boston Celtics, however, one thing Walker wasn’t able to do was bring the city its 17th championship. In 2005, Boston shipped Walker to the Miami Heat where he played a crucial role in helping the Heat win their first championship. In the 2006 NBA Finals, Walker averaged nearly 14 PPG and had a double-double in the title-clinching sixth game. 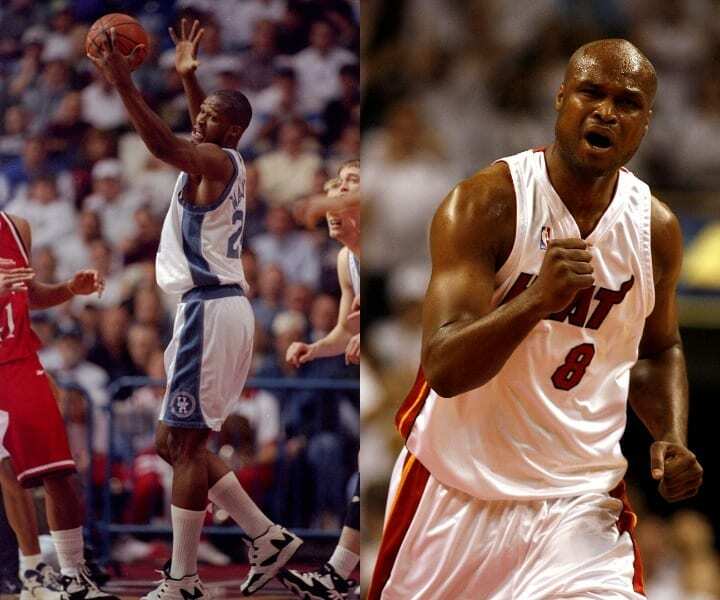 Before the NBA, Antoine Walker starred at the University of Kentucky and was a fixture on the Kentucky Wildcats’ 1996 national championship team. In 2010, Walker had to declare for bankruptcy after a series of questionable investments and financial misdoings. A prolific three-point shooter, Jason “The Jet” Terry was a four-year player at the University of Arizona from 1995-1999. As a senior, Terry won the Pac-10 Player of the Year. Two years earlier, The Jet helped his Wildcats win the 1997 NCAA Championship. In a battle of Wildcats, The University of Arizona prevailed over the University of Kentucky 84-79. Atlanta selected Terry 10th overall in 1999, and in 2011, as a member of the Dallas Mavericks, Terry won his first and only NBA title by defeating the Heat in six games. 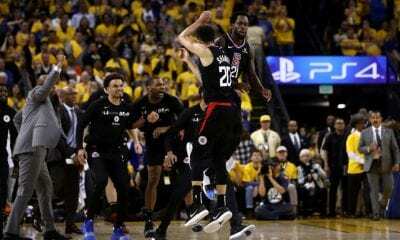 In the series-clinching Game 6, Tery notched 27 points off the bench. The second-leading scorer in UConn men’s basketball history is Richard “Rip” Hamilton, a sharpshooter from Coatesville, Pennsylvania. At UConn, Hamilton had a prolific career, winning two Big East Player of the Year Awards and a national championship. Hamilton was also named the tournament’s Most Outstanding Player following UConn’s historic upset over Duke University in the 1999 title game. Taken seventh overall by Washington in the 1999 Draft, Hamilton was traded to Detroit before the start of the 2002-03 season. In Detroit, Hamilton asserted himself as one of the league’s marquee players. In 2004, Hamilton and the Pistons upset the L.A. Lakers in the NBA Finals, winning the series in five games. The haters are abundant with Shane Battier, a Duke star who did just about everything right on the court. Battier, who had a seemingly innate ability to draw charges and hit clutch shots, was one of the nation’s least exciting players. He was also one of the most technically sound players in Duke history. 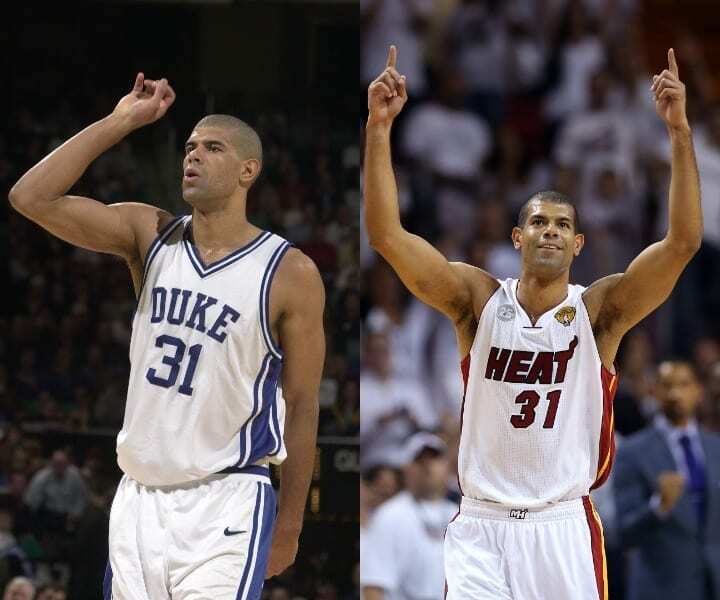 In 2001, Battier, considered one of the best players in the country, led the Blue Devils to a victory in the national championship game over Arizona. In 2011, Battier signed with the Miami Heat and won back-to-back Finals over the Thunder and Spurs. Battier retired following a loss in the 2014 NBA Finals. In the 2008 National Championship game, the former Kansas point guard hit one of the biggest shots in tournament history. Down three points to Memphis with just 2.1 seconds left on the clock, Chalmers pulled up and drilled the tying three-pointer, forcing overtime. In the ensuing overtime period, Chalmers and the Jayhawks pulled away from the crestfallen Tigers, capturing the school’s fifth national title. Chalmers was named the tournament’s Most Outstanding Player. 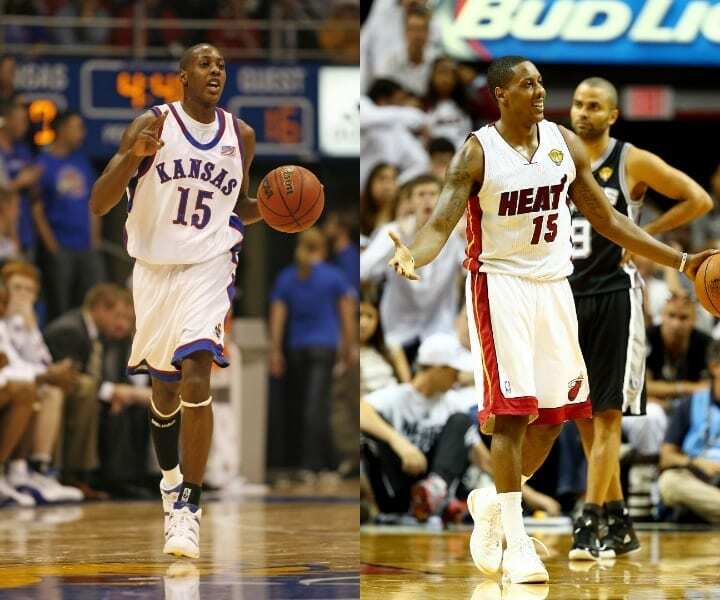 Not regarded as a top prospect, Chalmers fell to the second round in the 2008 NBA Draft. With the Miami Heat, “Super” Mario won back-to-back titles as LeBron James’ point guard. 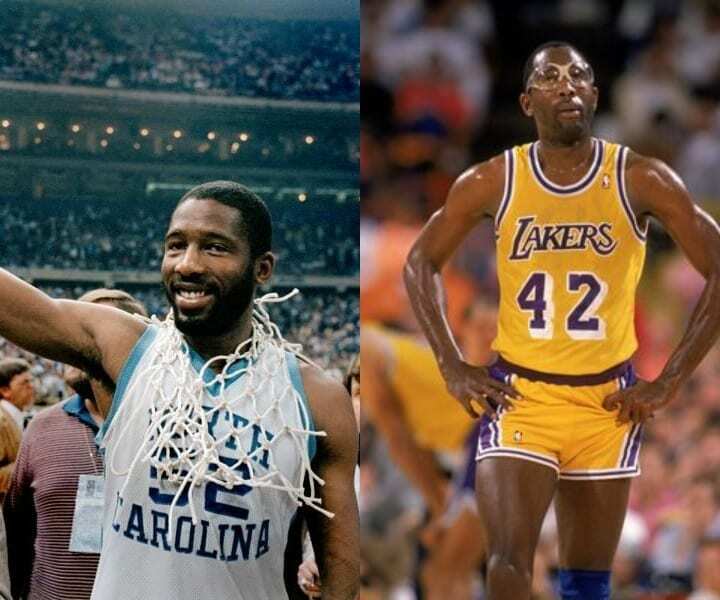 Surprisingly, the University of North Carolina, a program steeped in history, has had only three basketball players win both an NCAA Championship and an NBA title: James Worthy, Michael Jordan, and Danny Green. As a senior, Green helped the Tar Heels win the 2009 National Championship, defeating Michigan State 89-72. Although Green was a sound, fundamental player, many NBA scouts and executives overlooked him. 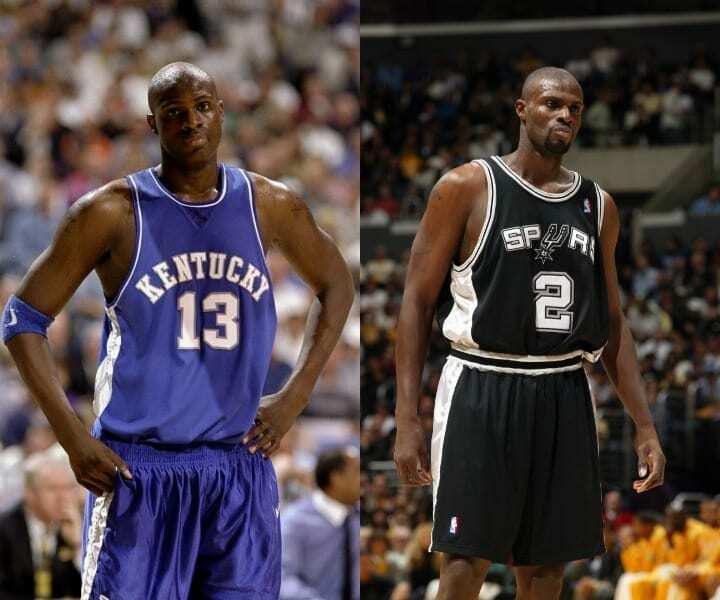 In the NBA, Green’s career got off to a lethargic start before he found his footing with the San Antonio Spurs. With the Spurs, Green used his defensive prowess and three-point shooting ability to help the team win the 2014 NBA Finals. When you’re teammates with Bill Russell, the likelihood that you’ll succeed is astronomically high. K.C. 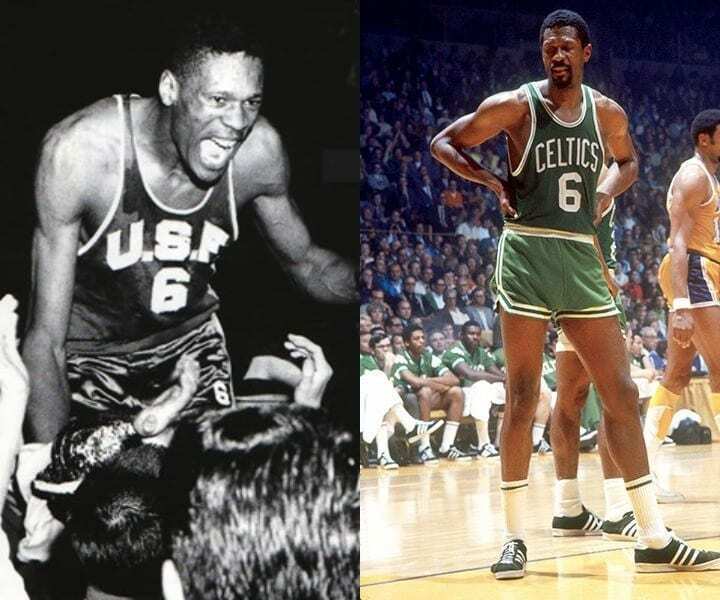 Jones, an extremely talented player in his own right, was fortunate enough to play at the University of San Francisco with Bill Russell. There Jones won two NCAA championships but was not considered one of the country’s most elite guards. 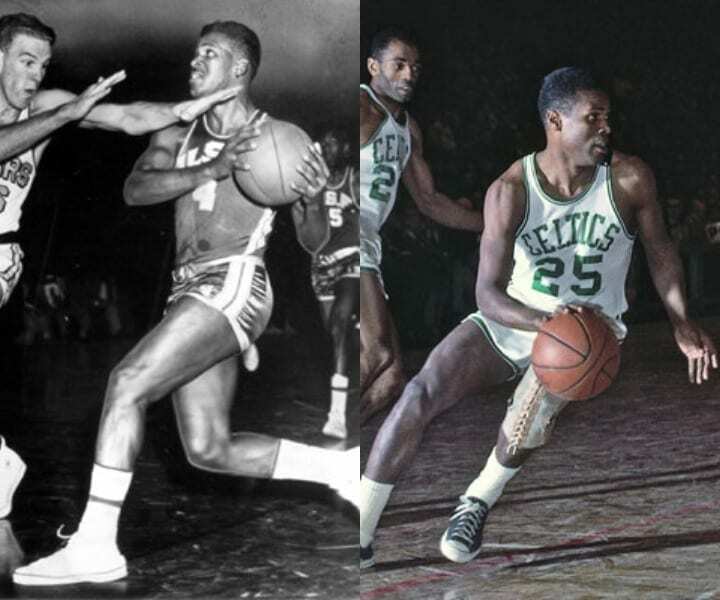 The Celtics drafted Jones in the second round of the 1956 NBA Draft where he’d once again link up with Russell. With the Celtics, the preeminent team of that era, Jones won eight NBA Finals. After retiring, Jones coached the Celtics and won two additional Finals. As a freshman mostly riding the bench, Nazr Mohammed won his first NCAA championship after his Kentucky Wildcats defeated the Syracuse Orangemen in the 1996 National Championship Game. Two years later, with Mohammed established as one of the most feared big men in the country, the Wildcats again were crowned champions after beating the Utah Utes in the 1998 title game. In the NBA, Nazr Mohammed bounced around the league before landing on the Spurs during the 2004-05 season, becoming the team’s starting center. In the 2005 NBA Finals, Mohammed and the Spurs eliminated the defending-champion Detroit Pistons in seven games. In the mid-2000s, the Florida Gators basketball team exploded onto the national scene, winning national championships in 2006 and 2007. 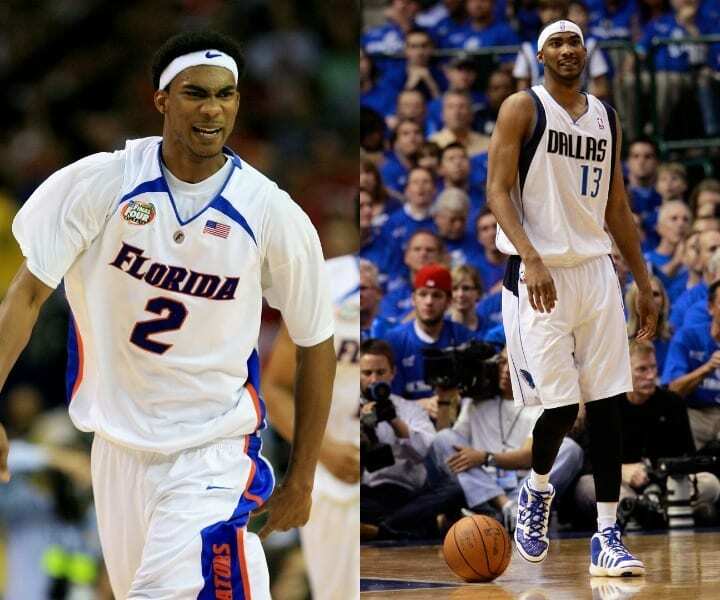 Brewer, along with Joakim Noah, Al Horford, and a few other future NBA players, helped establish the Florida Gators as one of the most electrifying teams in the nation, capable of scoring in droves while playing suffocating defense. 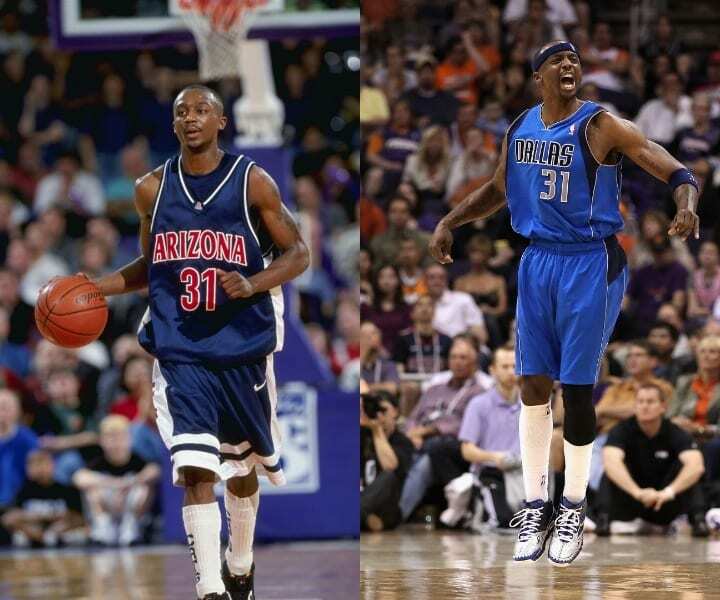 After an outstanding 2007 tournament, where Corey Brewer was named the Most Outstanding Player, the Minnesota Timberwolves selected him with the No. 7 pick in the draft. In 2011, Brewer signed with the Dallas Mavericks, winning the NBA Finals in his lone season there. In 1996, the Kentucky Wildcats, a team replete with future NBA talent and considered one of the greatest college squads ever assembled, beat the Syracuse Orangemen in the national championship game. 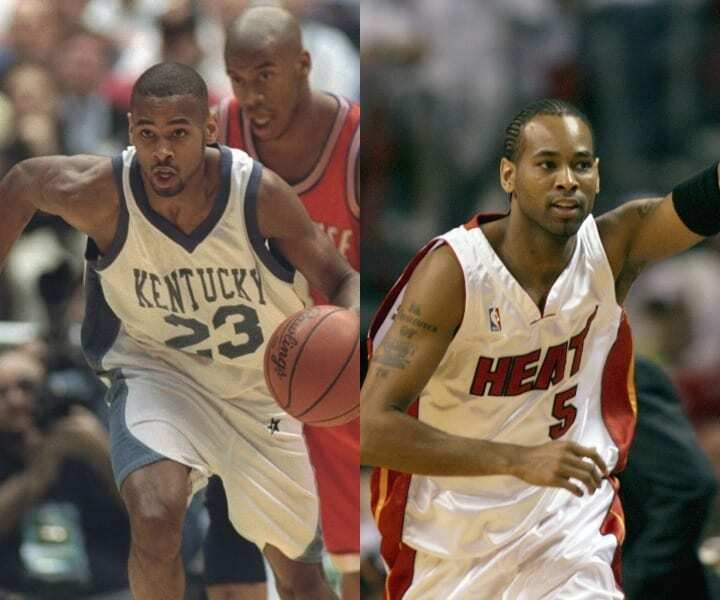 Anderson, a role player on the team, went on to play one more year at Kentucky before turning pro. In the 1997 draft, Cleveland selected Anderson with the 13th overall pick. 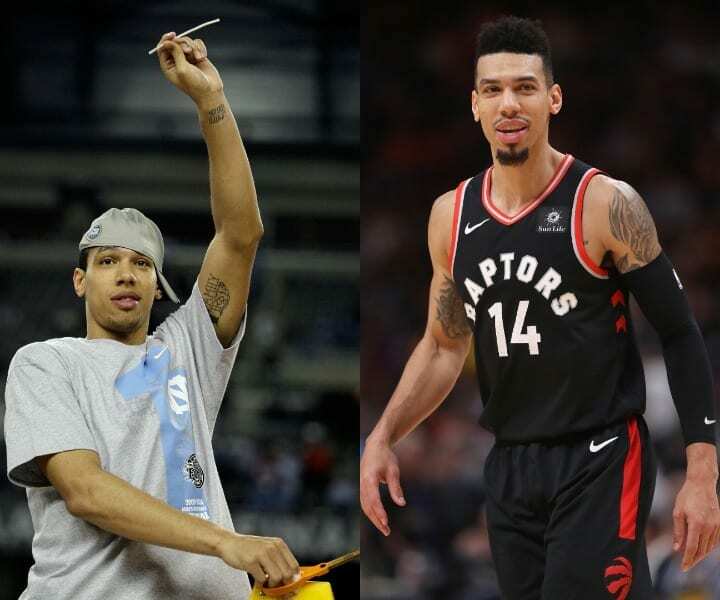 Ten years after winning his lone NCAA title, Anderson found himself atop the NBA after his Miami Heat beat the Dallas Mavericks in the 2006 NBA Finals. It was his only season in Miami and his only NBA title. Hailing from Mount Vernon, New York, Rodney McCray was a small forward on the Louisville Cardinals. In 1980, McCray helped the Cardinals beat UCLA in the title game by a final score of 59-54. Following an impressive four-year career, McCray headed to the NBA where the Rockets selected him third overall in 1983. McCray played for four teams throughout his 10-year career. In 1993, as a member of the Chicago Bulls, McCray won his first and only NBA title. Considered a defensive stalwart, McCray averaged 11.7 points and 6.6 rebounds for his career. In 1988, McCray made the NBA All-Defensive team. 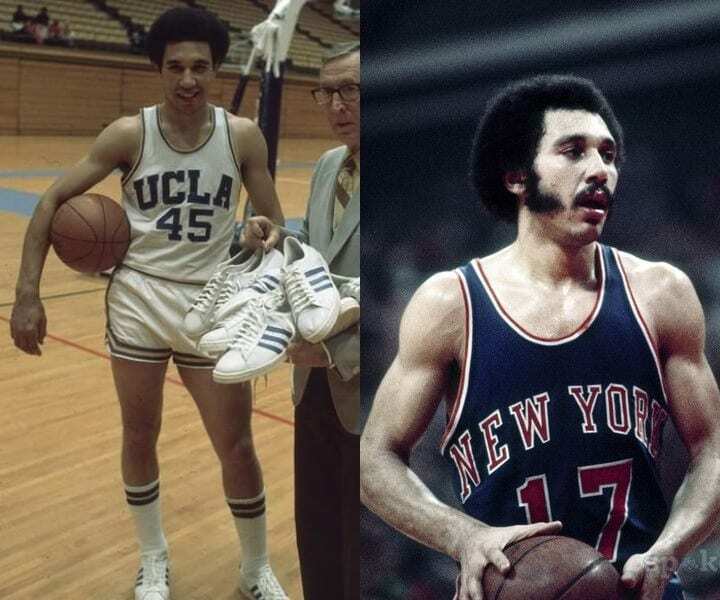 The father of NBA point guard Mike Bibby, Henry Bibby was the starting point guard at UCLA from 1969-1972. In those three seasons, Bibby won three national championships and was an All-American in 1972. Despite the prolific success at UCLA, Bibby wasn’t considered a star and slipped in the 1972 NBA Draft. Taken by the Knicks in the fourth round, Bibby won his only NBA title during his rookie season. Bibby averaged 8.6 points and 3.3 assists during his nine-year career. After retiring, Bibby took up coaching and led the USC Trojans for nine seasons, making the NCAA Tournament three times. Ohio State Buckeye killler. 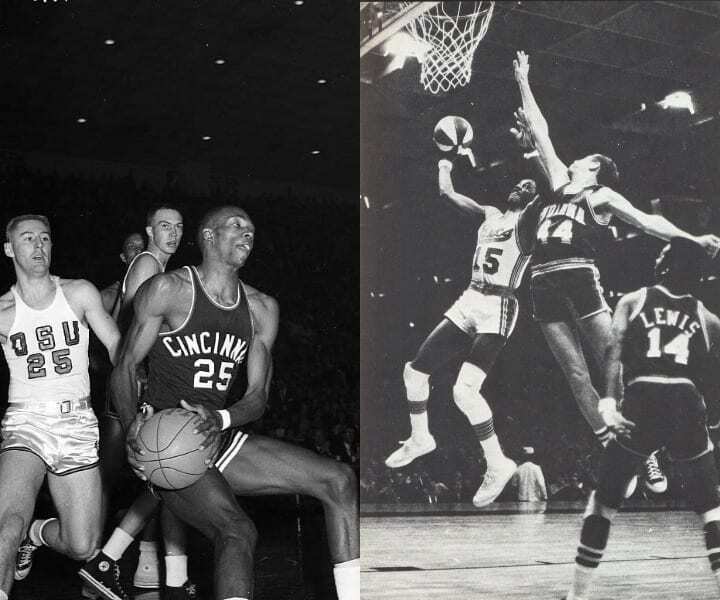 Tom Thacker starred at the Univesity of Cincinnati from 1960-1963 and gave rise to the Bearcats basketball program. Although Cincinnati is usually stuck in Ohio State’s shadow, Thacker helped thrust his school into the national spotlight. He did so by leading the Bearcats to back-to-back national championships, each time over the Buckeyes. In 1961, Thacker and co. beat Ohio State 70-65. The following year Thacker again squashed the Buckeyes in the title game 71-59. 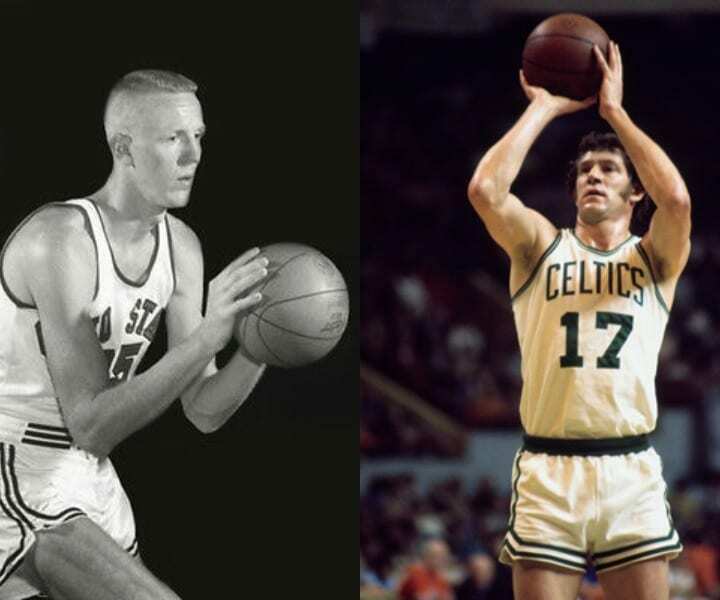 As a member of the Boston Celtics, Thacker and the Celtics defeated the Lakers in the 1968 NBA Finals, giving Thacker his only ring. Somehow, someway, Quinn Buckner was able to deal with fiery Indiana coach Bob Knight. And getting on Knight’s good side proved to be very valuable for Quinn Buckner, an elite defender. Buckner played at IU from 1972-76 where he was a captain for three years and a starter for four. During his senior year, Buckner led a dominant Hoosier team to the national championship game where they defeated Michigan 86-68. 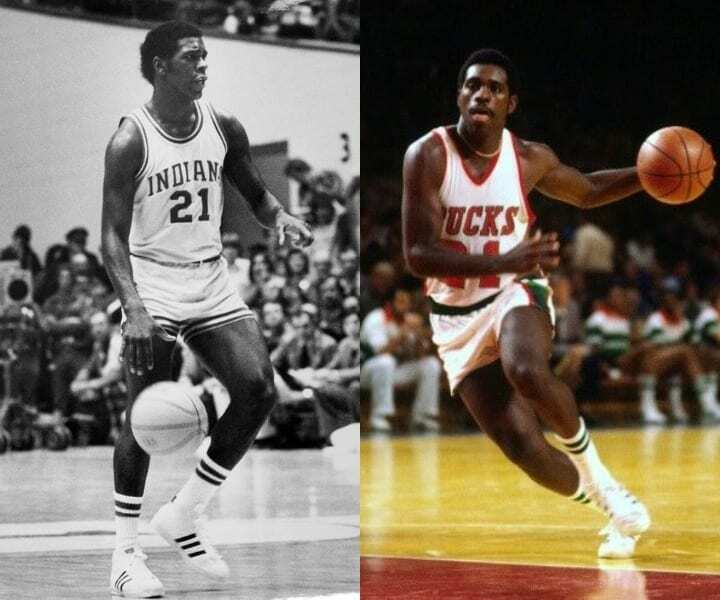 Milwaukee selected Buckner with the seventh pick in the ’76 draft and in ’82 traded him to Boston. Two years later Buckner and the Celtics won the NBA Finals. After retiring, Buckner went onto a career in broadcasting. La Salle University, a small school located in Philadelphia, Pennsylvania, is not thought of by many as a basketball powerhouse, because they’re not. But in 1954, something magical happened. La Salle made an improbable run to the national title game. In the title game, the Explorers pulled off a stunning victory over Bradley University, another school not known for its basketball program. Tom Gola, one of the nation’s most athletic players, led the La Salle Explorers to the program’s only national championship in basketball and was awarded the tournament MVP. Gola then went on to play for the Philadelphia Warriors where, in 1956, he won his only championship. In the 1960 National Championship Game, The Ohio State Buckeyes thrashed the California Golden Bears by a score of 75-55, and leading that charge was Jerry Lucas, a 6-foot-8, 230-pound center. At Ohio State, there wasn’t a player in the nation who could stop the deft scorer and dominant defender. The best one could hope for was to simply slow him down. In 1961, Sports Illustrated named Lucas the Sportsman of the Year despite the Buckeyes’ loss in the national championship game. In 1973, Lucas, then a member of the New York Knicks, won his only championship at the professional level. A teammate of Jerry Lucas, Larry Siegfried won the 1960 National Championship. One year later, his Buckeyes were upset in the title game by their in-state rival Cincinnati. Despite the loss, Siegfried was named to the All-Tournament team. 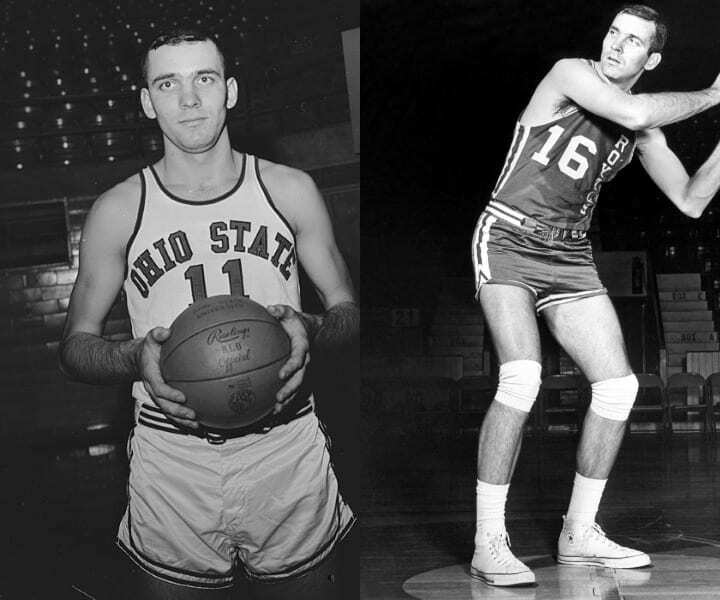 Following his illustrious career at OSU, Siegfried went to the NBA, playing for four different teams. His most successful run in the NBA came as a member of the Celtics where the 6-foot-3 point guard won five championships. After his tenure with the Celtics, Siegfried played for the Hawks before retiring from the NBA after the 1971-72 season. He passed away in 2010. Another member of the back-to-back club, small forward Keith Erickson played a huge role on UCLA’s championship teams in 1964 and 1965. In 1964, the Bruins easily defeated the Duke Blue Devils. One year later they beat the Michigan Wolverines by 11 points. 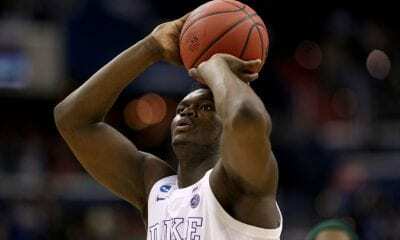 After his college career wrapped up, Erickson tried his luck in the NBA. The San Francisco Warrariors selected him the third round of the 1965 NBA Draft. 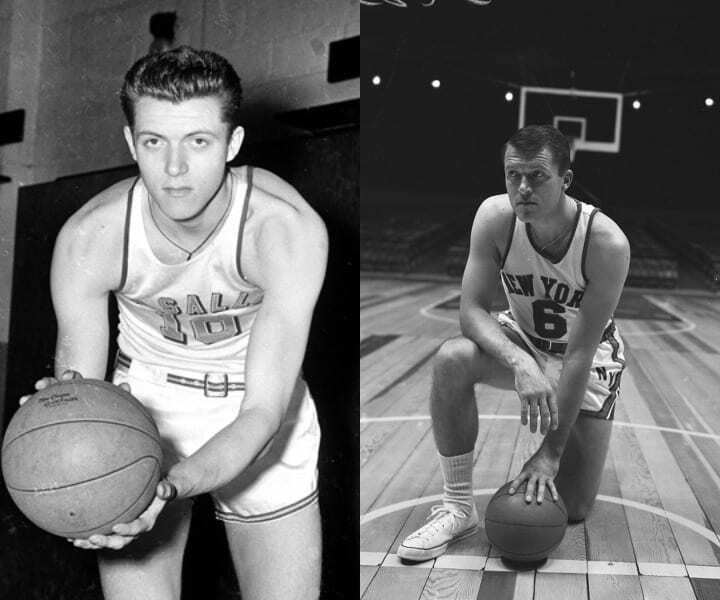 In 1972, Erickson, then with the Los Angeles Lakers, won his first and only title after his Lakers defeated the New York Knicks in five games. 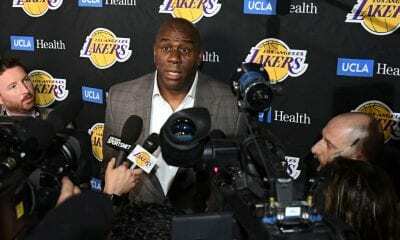 After retiring, Erickson became an announcer for the Lakers. 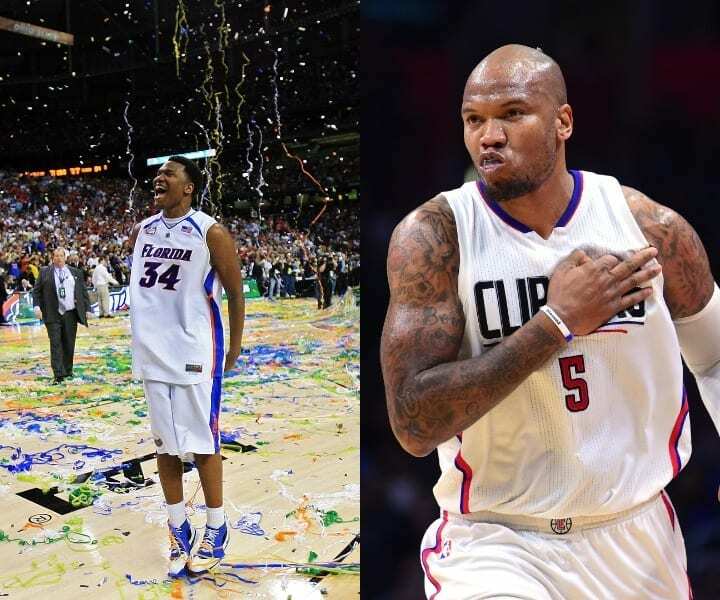 As a freshman on a Florida Gators team loaded with talent, Marreese Speights hardly saw the court, but he did get to experience winning a national championship after his Gators beat the Ohio State Buckeyes in the 2007 National Championship Game, the Gators’ second in a row. As a sophomore, Speights dominated and became one of the team’s stars. However, Florida was unable to win their third-straight championship, and after his sophomore season, Speights declared for the draft. The 76ers selected him 16th overall. After bouncing around the league, Speights found himself in Golden State where, in 2015, he’d win his first title. Following his NBA career, Speights signed a contract to play basketball in China.